Following mounting criticism of the pro-treaty bias of the Referendum Commission, éirígí has produced an alternative version of the Referendum Commission’s Austerity Treaty booklet. The alternative booklet includes the anti-treaty analysis that the Referendum Commission excluded in its original document. Speaking following the online launch of the alternative booklet éirígí’s Daithí Mac An Mháistir said, “The Referendum Commission is meant to provide people with non-biased information to help them make an informed decision in referenda. 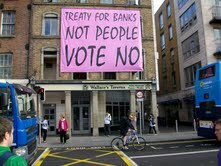 This is not what has happened during the course of the Austerity Treaty campaign. “The Referendum Commission has been reduced to a proxy press office for the Yes campaign. Both the letter and the spirit of the Crotty judgement have been completely abandoned by those who run the Commission. The leaders of Europe spent much time and ingenuity in designing the Financial Stability Pact so that it would not require a vote. The fact that Britain and the Czech Republic did not sign meant that it could not be formally part of European structures. The major powers went ahead anyway. The Irish government signed without a murmur. This ad-hoc arrangement was to become law over European citizens behind their backs, outside the formal (and already undemocratic) European structures, with a recommendation that it be written into individual constitutions. The Fine Gael coalition, having explored every legal avenue to try to amend the constitution without a vote, now tell us that there is no alternative to voting yes to the Pact. I write in reply to Pádraig Yeates’s letter (May 9th) concerning the events of more than 40 years ago. The Irish Press of January 29th, 1971 (Book Review page) carried an extensive review by me of Dr J Bowyer Bell’s The Secret Army: A History of the IRA 1916-1970. 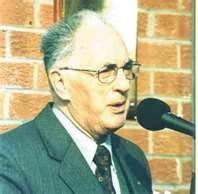 In it I dealt with the army convention of 1969 and Sinn Féin ard-fheis of 1970. 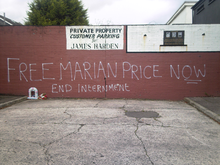 It’s a mark of the new post-Orange six-county statelet that someone like Barra McGrory can be Director of Public Prosecutions and, in this post, be in charge of what the Republican Network for Unity has called “imprisonment by remand”, following the recent arrest of seven republicans (not to mention the ongoing imprisonment and mistreatment of Marian Price). Only a couple of months ago, McGrory was defending the renewed use of supergrasses. When a supergrass trial of a dozen loyalists accused of murdering a leader of a rival loyalist group came unstuck at the end of February – all 12 were acquitted – McGrory defended the legislation that had made the trial possible. I get a steady but very small stream of emails from people being very positive about the blog. Also, hits on the blog have been about 300% higher this year – on a month-to-month basis – than last year. So there is clearly an audience and there is a layer of people who are glad the blog exists and see a use for it. 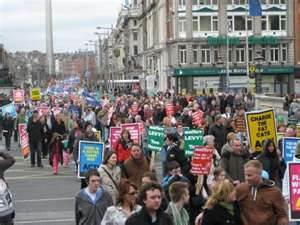 In the past six months a small number of people in Ireland, centred in Kildare, have started to write for it, mainly about local events such as the struggle of the turf-cutters, but also about wider stuff like the Austerity Treaty, the Household Tax, the anti-nuclear movement of the 1970s and so on. There is also a Belfast-based contributor. Once in a while, I’ll even get people leaving comments on articles! It would be great to get more feedback, in terms of comments on articles, and in terms of writing stuff. For instance, I’ve had a number of people email me to say what a good idea a political economy research/writing project would be, but only one solid offer of involvement. So, at present, that project is on the back burner. I’ll get up some more material about Marx’s critique of political economy (basically how capitalism works, why it goes into crisis and so on) over the next few months and then refloat the idea. Such a project could also suit people outside Ireland. People who might have more time, because they’re not involved in the level of activism that is possible and necessary in Ireland itself. If there are any readers outside Ireland who haven’t contacted me about the idea of the Claochlú project simply because they live in some other country, I’d actually love to hear from you! I’m only too aware that some stuff I had promised to get up by the end of May is not yet up. In particular some book reviews, the Markievicz pamphlet What Republicans Stand For, and something on the role of government spending in a specifically capitalist economy and why the Keynesian call for its expansion will make the crisis worse not be some kind of improvement. In the next couple of weeks I am rather frenetically busy, but will be able to get up some of this stuff. From mid-June, however, my work-work eases off a fair bit and I’ll have more time to work on the blog. One of the things that I hope to be able to do is a weekly review of what’s on socialist-republican sites. I’m often tempted to put up heaps of stuff on this site from those other sites, and I do in fact put up quite a lot. In future, however, while I’ll still be putting up stuff from those sites, I’m going to cut down the amount of it by doing a regular review with links to particular articles and videos. What I want to start getting stuck into after mid-June is book reviews; more interviews; a series of educational study guides on Irish history, Connolly, Costello and Marx & Engels (in particular around the intertwined national and class question); and work on the political economy of the island today. I will also be continuing to argue for socialist-republican unity in action. I believe the mid-long term aim of such unity in action should be the formation of a single socialist-republican organisation but even unity in action for its own sake would be a significant step forward. For instance, I think it’s crazy that each organisation has its own Easter commemoration. What is so difficult about, for instance, éirígí, the IRSP and the RNU – all of which declare themselves to be unequivocally socialist-republican – holding common Easter commemorations? What law of the universe, let alone of socialist-republicanism, declares that they must all hold separate commemorations? From what I can see the only reason this happens is that the three groups all arose at different times from different splits – one a split from the Officials and the other two arising originally from recent splits in the Provos. OK, fair enough, that’s just how things happen. But can we now not move beyond how things historically have created these three organisations to understanding the need to act consciously to maximise the impact of socialist-republicanism and build a revolutionary movement across the island? Take the Easter commemorations. Imagine a joint éirígí/IRSP/RNU commemoration in Belfast and Dublin. Have a speaker from each organisation plus someone like Bernadette. Mobilise everyone that can be. In fact, for events like Easter commemorations, invites could go to groups like the 32CSM (who don’t call themselves socialists, although most individual members probably would) and RSF, who may be determined All Aloners but who may also surprise – don’t know until you try them. In the meantime, socialist-republican disunity makes the Brits and the Free Staters stronger and leaves the Provos laughing all the way to Stormont. And the working class puzzled. Anyway, enough of the frustrated rant. The other practical thing I want to do is start organising some public meetings here to build solidarity with socialist-republicans in Ireland and publicise issues around the prisoners and repression. 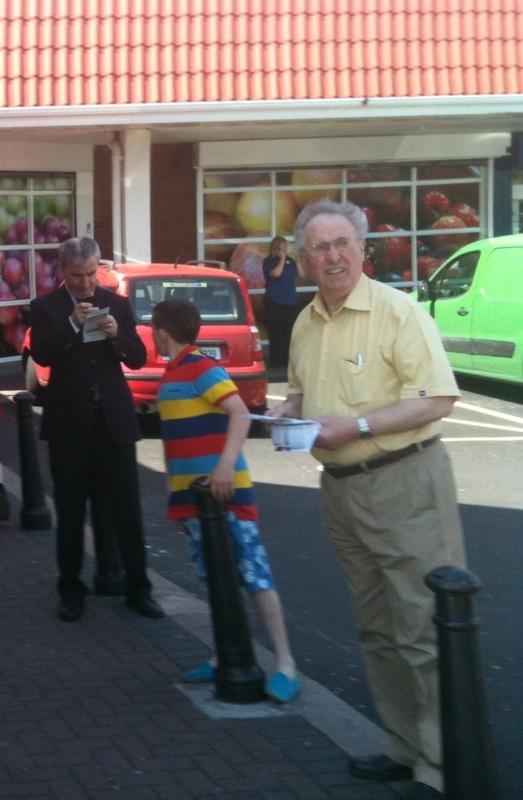 On Saturday May 26th, Fine Gael’s Gay Mitchell, accompanied by a couple of his party’s finest, descended into Ballyfermot, for a less than convincing canvass in support of the Austerity Treaty. As the Blueshirts attempted to distribute their propaganda outside the local Tesco’s, the reaction from the general public would be best described as frosty. 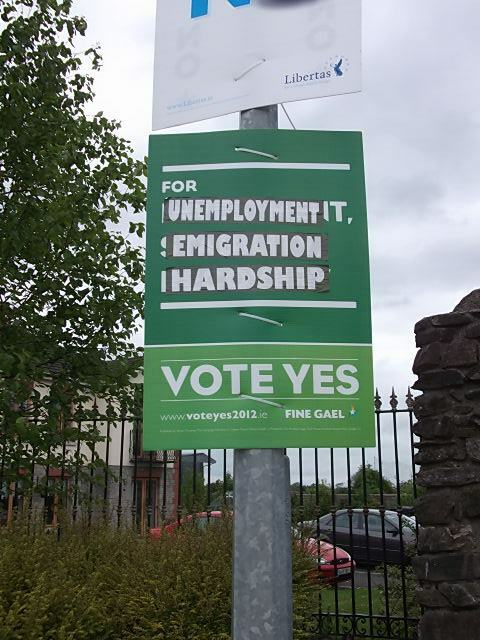 The Fine Gael team were left in no doubt that they weren’t going to have it all their own way. 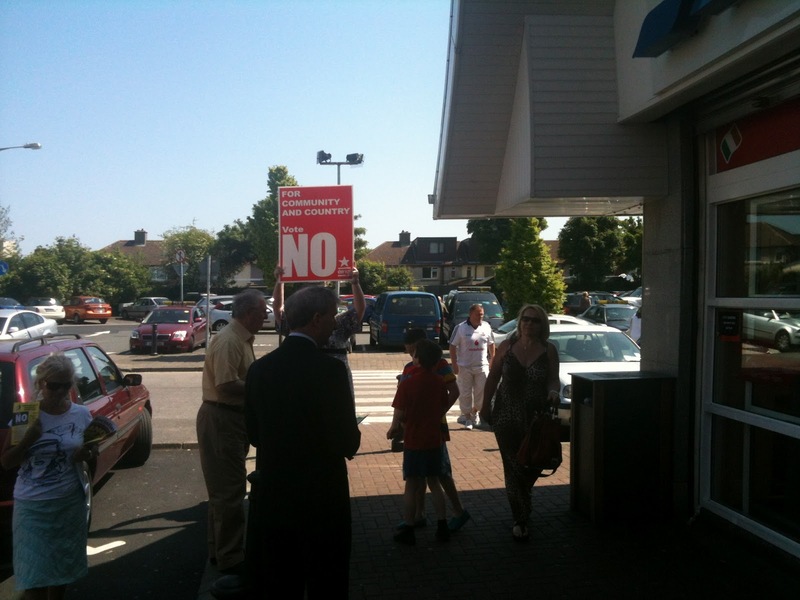 Following a phone call to éirígí from a local supporter, a squad of éirigí Ballyfermot activists arrived on the scene and held an impromptu NO To Austerity picket, urging people to vote NO on May 31st. New era of jailing by remand? The arrest and imprisonment of seven republican activists within the past few days heralds a new era for British oppression in Ireland. Following intense debate amongst government ministers, the military and its legal establishment since 2006, it would appear that the British state has now decided to use so-called ‘intercept evidence’ as viable evidence to imprison Irish republicans. The introduction of this material to Diplock courts has been made possible by the acquiescence of the Public Prosecution Service under the watch of Barra McGrory, who by his recent actions has betrayed the principles of human rights that he once worked to defend. So called ‘intercept’ evidence, including covert recordings and car tracking can easily be manipulated in order to secure at the very least gaoling by remand of political activists. Going on past experiences there is no doubt that the PSNI assisted by British Military intelligence will take advantage of this tactic to imprison any activist who opposes the political establishment in modern occupied Ireland. 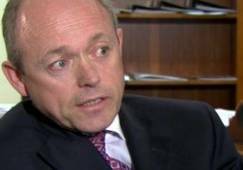 Barra McGrory has effectively opened the gate to unlimited internment in the north, he has colluded with the most corrupt elements of the British state to further his career and for private gain, he should be thoroughly ashamed of himself. Once again, RNU states clearly that supporters of the Stormont establishment here seek to curtail and imprison all and any activists who organise politically outside of the sphere of the GFA. In the face of this onslaught on our liberty, it is vital that practical republican unity is applied as we are all vulnerable to attack, from a legal system which has joined with the most corrupt states in the world. Cogús POWs in Maghaberry have requested from their supporters on the outside, assistance in building a political library for republican prisoners there. The segregated ‘library’ currently provided by the prison authorities is nothing short of feeble with only a non political sterile choice of literature available. Prisoners are asking that supporters send any worthy political literature (Left wing / Anti-imperalist) through RNU/Cogús who will ensure that it reaches Roe House. Please note that ONLY SOFT BACK BOOKS WILL BE ALLOWED INTO MAGHABERRY.